ARPA was the Advanced Research Project Agency which we now know as DARPA. The Saturn I program was started under ARPA before NASA took it over. It wasn't under ARPA very long before the switch but they put out the original SPEC of 1,500,000-lb thrust space vehicle. e of pi bringing up solid rockets reminded me of a question I've had for some time: Is there something in particular about solid rockets that make them good for making strap-on boosters out of? 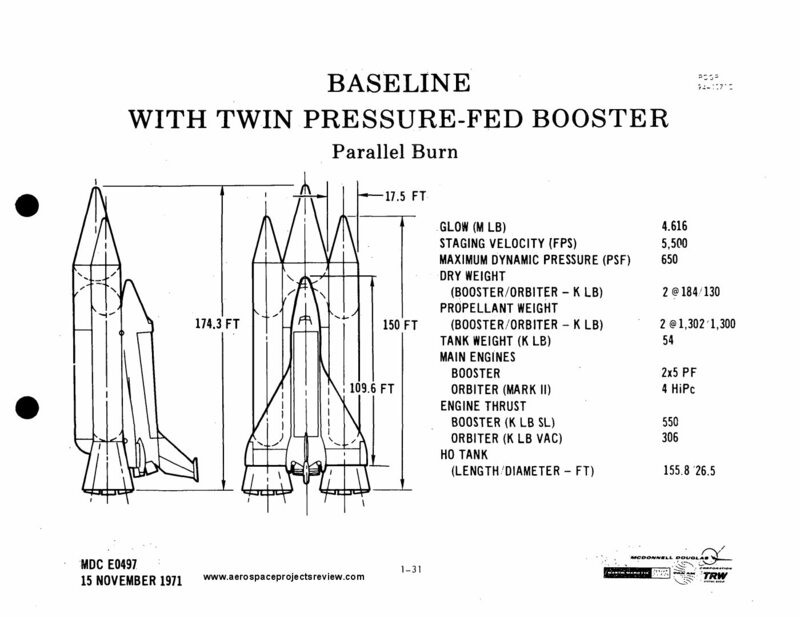 I wonder because I've never seen an american proposal for boosters that isn't solid fueled. fasquardon: easy way to get high TWR. You don't have to pump, or feed by pressure, liquids; instead you just light the solid and shape the grains and the open area (burning surface) so it burns quickly. Also, due to their high density, in the zeroeth stage solids are competitive despite their lower specific impulse. There have been US liquid boosters. Atlas used them for example (it just shared the tank with the sustainer). They were planned for one of the Saturn V MLVs (2x F-1A), and are planned to compete with solids for later SLS blocks. There's been American liquid booster proposals, but there's something of a SRB mafia with strong lobbies, both in design thanks to the advantages above and in Washington. They were planned for one of the Saturn V MLVs (2x F-1A), and are planned to compete with solids for later SLS blocks. That's if ATK doesn't manage to get the competition squashed, which I hear they're trying to. Thanks for your answers e of pi and NathanKell. The first launch of the first satellite is much later than OTL, by some nine months or so. Vanguard was allowed to plod along until they finally got it right here. It really moots some retrospectively silly speculations I made early on--without Korolev, the Soviet space potential is simply retarded somewhat. No need to wonder whether Sinilshchikov's humility yields dividends in the form of a more unified space program; he's just not the genius Korolev was and the results are delayed. If he gets shoved aside by Chelomei, perhaps the latter can make a more impressive account of himself if he's allowed to go to hell in his own way. Perhaps for instance it will be Chelomei who eventually tires of the storables, and points out that they are great and necessary for a missile program, but Soviet space travel needs the somewhat higher efficiencies from ker-lox and even hydrogen-oxygen upper stages; with no Korolev around to say "I told you so!" he can be a maverick that way, the way he obviously enjoyed being. OTL Energia was an impressive swan song for him. But right now, the Space Age is simply delayed and developing slowly compared to OTL. It might be, as Eisenhower foresaw and latter-day AH critics today hypothesize, that without the pressure to come up with a crash program to put the Russians into the shade, the methodical plodding of an Eisenhowerian gradual space program will be better sustained and while the Moon might not be reached before 1970, when someone finally does get there they and their belated rivals will come to stay. So we might come out ahead of OTL eventually, from either side. But right now, both sides are behind the OTL curve. I expect any given milestone one likes to posit--first successful spy sat, first successful comsat, first person* in space, first geosynch comsat, first weather satellite, whatever, to be somewhat delayed, between a year and six months, behind the OTL achievement date, though someone or other pushing the pace harder or benefiting from the advantages that come to the patient, as the case may be, to later push it harder or enjoy smoother sailing, and so pull up to OTL or even ahead eventually. *It is not yet too late as far as we readers know anyway, though perhaps too late from the author and advisory points of view, for the Soviets to get really desperate and decide to orbit an even more minimal first cosmonautical craft than Vostok, one whose mass minimization goes so far as to choose a very small woman to be the first human in orbit, so as to allow other systems to also be skinned to the bone mass-wise--as in that Arthur Clarke story whose title I forget, where this is done but she lands back on Earth in an unexpected place with dark consequences. The Americans, even if they do panic a bit, seem less likely to do this in the late 50s/early 60s, and nothing short of a Soviet first cosmonaut who survives seems likely to panic the Americans at all here. Transportability issues: Solid propellants are cast into the motor in the factory, unlike liquid fuel rockets which can be fueled at the launch pad. This means they have to either be: 1) limited in size to be transportable (as for the Delta and Ariane strap-on motors); 2) cast in segments, with the segments assembled at the launch base (as for Titan and the Space Shuttle); or 3) cast in a factory at the launch site (actually done for large test motors intended for Saturn V upgrades). Welcome to the thread NathanKell! I only found out about the Atlas sustainer boosters when researching this TL, and it seems a rather clever solution for getting an early high-thrust boost without the added weight of full boosters. It reminds me of the cross-feed solution SpaceX have come up with for Falcon Heavy. Indeed, one factor that can never be overlook in space systems design is the political dimension, i.e. how to persuade someone to give you the money to fly. Often that means flying with something that wouldn’t be your first choice on technical merit - or even not flying at all, but supporting an industrial base. On that basis, Ares I and V were actually very good designs, as Congress seemed happy to continue funding them indefinitely if the White House hadn’t pulled the plug. Similarly, SLS is able to maintain funding (and in fact regularly get voted increases) even though it has no mission. Eisenhower was very aware of this sort of dynamic, when he warned of the Military-Industrial Complex in his OTL farewell speech. It’s something he’s wary of ITTL too. As mentioned in some previous responses, it’s not quite as simple as just retarding the programme. Choices have been made that impact the focus of Soviet efforts, as well as American that will have repercussions down the line. I believe Energia was actually developed under Glushko rather than Chelomei, but your point remains valid. So far ITTL Mishin is the only significant voice against storables in the Soviet rocket industry, and he's been marginalised, so if the other Chief Designers did wish to reconsider they would lose less face than IOTL. I’ve long been an advocate that from an engineering perspective the first mission to Mars should be crewed by women, preferably Asian. Aside from the body mass savings, the lower number of calories needed by women compared to men translates to huge savings in consumables. Politically a tricky sell though, and morally very sexist! Glushko did design the Energia/Buran System. But only on orders from the Soviet Leadership who wanted the maintain parity with the US, which meant making an LV that featured LOX/LH2 as a substantial portion of its propellant mass. That's why his original RLA Complex which he designed shortly after securing leadership of the Soviet Space Effort was rejected, since it didn't offer much of what they wanted from a new system and was seen as overpowered for the missions they did have planned. Very true. RLA was a kerosene-LOX design (similar to Eye's Vulkan), so it seems Glushko did come around to the idea of non-toxic propellants - once his rivals were safely dead or marginalised! I think part of the reason for his opposition to Cryogenic Propellants in the 1960's stemmed from a mixture of not being suited for military applications, and his own grudge with Korolev. And the military did specify that their next-gen LVs HAD to use non-toxic propellants, which bound Glushko to exactly that IIRC. And having secured his leadership he'd sought for so long, I'll agree that he likely felt it was safe for him to drop his reluctance to design Closed-Cycle LOX/Kerosene Engines. Will there be a launch facility in Texas? I suppose it is possible, but I imagine the reasons that prevailed OTL to concentrate the launches at Canaveral would dominate here too. Vanguard was launched from the Cape, right? And so was Von Braun's rocket? Texas can rival Florida for low-latitude launch sites, and Canaveral is not the lowest latitude that can be reached in Florida so Texan latitudes are clearly acceptable. I think the advantage of Canaveral over a Texan Gulf Coast site is that the launch tracks out of the southern Texas coast are restricted by all the inhabited land downrange. The Florida coast is somewhat more accessible to the developed industry of the Northeast and Midwest--it is in the same time zone as Washington DC and New York city, which might have had some bearing on the decision to put the main rocket base there too. Now of course as NASA developed OTL the HQ of manned space flight was placed at Houston; Michel Van recently has mentioned somewhere or other something I've never heard of from anyone else but seems plausible--that there was a plan to develop the STS launch and landing facilities at a new site on the Texan coast; manned spaceflight in the Shuttle era was indeed supposed to move to Texas, leaving Cape Canaveral for other types of launches--including perhaps the launch of ultra-heavy payload on Saturn V or bigger rockets? I guess that fell through with tight budgets, the realization that with its solid boosters STS lauches would be quite comparable to a Saturn V launch so the existing Saturn/Apollo facilities in Florida would be needed--and available, with no megalauncher in the works and the Saturn Vs all launched or stuffed and mounted as museum pieces. So a timeline where the manned space budget is about like OTL would probably keep using Canaveral; one with a much flusher one might develop a Texan site after all--but with the butterflies flapping and the dice rolling in this ATL I don't know how likely Texas will be chosen as the site of a major space program HQ. Even without such an incentive, southern Texas remains high up on a very short list of alternative or additional launch sites on US soil. Hawaii might be better than either mainland state from many points of view, but economically and logistically it would be a nightmare. I've considered Puerto Rico but aside from comparably poor logistics, and alongside extra political complications, there don't seem to be any good launch sites in the Caribbean because there are always many islands close by downrange to the east, until you get to the easternmost of them--and these are invariably very small islands, no good place for a major spaceport complex. I'd think that in most timelines, wherever the initial rocket complex gets established--most likely the Florida coast, and perhaps Cape Canaveral is the only place along it bypassed by major civil development--the tendency then will be to expand that base and establish it as the main base, getting as much use as possible out of legacy facilities. It's not that the Cape was bypassed by civil development, IIRC; it's that it already *had* the makings of development. It was an excellent site for a port, and I seem to recall something of a large port being mapped out during WW2 and construction started. Especially when everyone was thinking on the scale of Von Braun's '48 and '52/Colliers behemoths, water access combined with good rail access was thought to be important. I've also considered alternate sites (for the US in Reaching for the Stars), but came back to the Cape because, dangit, it just makes sense. Further south has poorer rail and sea access, islands off the coast restrict launch azimuth, or other considerations, and as you mention Gulf coast Texas has even worse azimuth problems. And a degree or two lower doesn't really gain you that much extra rotational boost. nixonshead: thanks for the welcome! Atlas is a quite ingenious design--bar none the best dry mass fraction that's ever flown, AFAIK. It and the R-7 have a ton in common (similar difficulties, similar choices), although Atlas gets around staging the tankage as well as the engines by using balloon tanks. The FH's crossfeeding is also a good comparison, as you say, although it's interesting to note that even there they can't do full-on crossfeeding. Oh, heh, tying it all together: I believe the original plan for the R-7 was to crossfeed! Don't recall the cite though. To be honest, at this stage I don’t know! As pointed out by others, the Cape has a lot of advantages, and much of the effort at this stage ITTL is focussed there, though we will be looking briefly at another site in the next Post. I've also considered alternate sites (for the US in Reaching for the Stars), but came back to the Cape because, dangit, it just makes sense. For me launching the first missiles from the Cape was a no-brainer as it was protected by the Soviet Secrecy Butterfly Net, but one interesting set of options I did look into involved the use of Tyuratam (aka Baikonur). Apparently the Red Army team responsible for picking the Soviet launch site narrowed it down to four options, with one of the favourites being a site in the Russian Caucasus south of the existing Kapustin Yar test range. That site would have had access to the Soviet canal network linked through the Volga as well as good rail connections. Chertok also notes it would have meant launch crews living on the Caspian coast rather than the Kazakh desert! That option, and the other two, were rejected as only Baikonur was compatible with the location of a chain of radio control stations needed by the R-7 - stations that became obsolete a few years later as inertial guidance was perfected! Korolev saw the silver lining of Baikonur as being almost unlimited space to expand into - and one can’t help thinking that if it were Russian fishing villages and resorts being polluted with rocket fumes rather than Kazakh yurts, the Council of Ministers might have had a bit more to say on propellant choices. ITTL, with the R-6 guidance development behind OTL’s R-7, the justification for using Baikonur/Tyuratam remains valid for even longer (which is a shame, because that canal access would have been very useful for later, larger rockets…). Oh, heh, tying it all together: I believe the original plan for the R-7 was to crossfeed! Don't recall the cite though. I also recall coming across this, I think in Chertok again. IIRC it was considered once they decided to ground-light all the R-7 stages, but in the end they went for the simpler option of extending the central core into a sustainer rather than adding all that complex plumbing. Wasn't the decisions to put some of the space stuff in Texas a political one? At least I thought it influenced it a little bit. Maybe that was just the stuff under Johnson though. Johnson was majority leader in the Senate in the late 50's and as VP was in charge of the space program for the Kennedy administration. Don't forget Vandenburg AFB, even if it is on the California coast it can do one thing easier than Canaveral can and that is a Polar orbit launch. Also since it is a military base it can be easily used for the spy sat launches that are generally in a Polar/sun synchronous orbit. I've enjoyed this timeline generally and the above discussion of solid rockets in particular. Allow me to put this post here, so I can find it for future reference. Johnson was also a driving force behind the establishment of NASA as a response to Sputnik IOTL. ITTL… “Sputnik”? What’s a “sputnik”? The reaction of the press all across the Free World to the launch of the planet’s first artificial satellite was a mixture of amazement, pride and a re-enforcement of the image of America as the source of all modern technical marvels. Vanguard 1 (as it had been retrospectively named, the Navy quietly brushing the payloads of earlier, failed attempts under the carpet) was orbiting the Earth once every 133 minutes at a distance of between 650 and 3 800 km. The high apogee meant that, despite its orbital inclination of just over 34 degrees preventing it from directly overflying much of the world’s population (and avoiding potentially provocative overflights of the USSR), it would be on a line of sight with most of the planet at regular intervals. Amateur radio operators immediately rushed to their equipment to pick up Vanguard’s “Beep-beep-beep!”, with the more determined even going so far as to attempt to derive the satellite’s orbital parameters from their own observations. However, after the initial fanfare of the launch, most people quickly incorporated the achievement as part of the backdrop of their lives and moved on to consider more pressing concerns. The reaction in the Kremlin was not so short-lived. In a short article on page 2, Pravda congratulated the Americans for their achievement, but warned against “any attempt to extend Imperialism into Cosmic Space." The article went on to reassure readers that “Soviet workers and scientists are even now preparing to launch their own space vehicle in response.” This response was to be made by the R-6, and pressure mounted on Sinilshchikov to get the rocket working. Khrushchev was keen to use a satellite launch to demonstrate how the Soviet Union was catching up with (and would soon surpass) the US, but more importantly he and Ustinov both knew that the Atlas ICBM was nearing completion. The Soviet military was only just starting to come to grips with the nuclear bomber threat; they could not afford to allow a missile gap to develop. But just one week after Vanguard entered orbit, the Shesterka suffered a second launch failure. This time it was the guidance system at fault, diverting the missile from its programmed course after just 45 seconds of flight, after which the missile was deliberately destroyed as a safety precaution. This second failure in a month was the final nail in Sinilshchikov’s coffin. He was immediately summoned to Moscow and stripped of his role as Chief Designer. He would be replaced at OKB-1 by Vladimir Chelomei, who coincidentally happened to be the boss of Nikita Khrushchev’s son Sergei. This was the realisation of a long-held ambition for Chelomei, and he had many plans for the future of Soviet rocketry, but for now Khrushchev and Ustinov made it very clear that Chelomei had one overriding priority: Get the R-6 flying. Chelomei set to work immediately. Bringing in many of his own people from OKB-52, he quickly set up an independent review of the R-6 design and production with the aim of identifying and eliminating any flaws that could cause a failure. Over the next month his team produced a slew of recommendations, mostly related to increased redundancy in critical systems, a tighter quality regime at the production facilities, and expanded testing of all systems before and after vehicle integration. After three months of furious activity, Chelomei was ready to allow Shesterka a third chance to prove itself. On 9th October 1958, an R-6 missile once again stood ready at Launch Complex 1, but this time things would be different. To the delight of the watching Nedelin and the satisfaction of Chelomei the missile made a perfect launch, delivering its dummy warhead to the Kamchatka test site 18 km from the aim point. Or rather, parts of the warhead. It seemed that the sharp-nosed, fast penetration configuration chosen to reduce enemy reaction times was not up to the job of protecting the bomb from the rigours of atmospheric re-entry and instead broke up in mid-air. However, this small detail was kept Top Secret, and TASS was soon announcing that the Soviet Union had developed an ICBM to rival the American Atlas. The Americans meanwhile were experiencing a few problems of their own. Although the USAF had performed a second successful test launch of the Atlas in August, reaching 2 500 km range, the Navy was having some difficulties in following up the success of Vanguard 1. Another attempt at orbit was made in September, but ended in failure when the second stage burn cut off prematurely, dooming the rocket to a watery grave. Determined to launch a second satellite before the International Geophysical Year ended on 31st December, the NRL engineers focussed all their energy on ensuring success on the next Vanguard. Their hard work paid off, with the flawless launch of Vanguard 2 on 18th December providing an early Christmas present to the team. Unlike the simple radio beacon payload of Vanguard 1 (which was still operating, powered by its solar cells, four months after launch), the Vanguard 2 satellite would carry a dedicated scientific experiment. Included in the 10 kg mass of the satellite were a pair of small telescopes, facing in opposite directions, at the focus of which was a photocell similar to those that powered the spacecraft. As the satellite spun on its axis, the field of view of the telescopes would sweep past the surface of the Earth, and the reflected sunlight they saw would generate a small current within the photocell. By measuring how the intensity of this current varied, it would be possible to deduce the reflectivity of the clouds, land and sea surface, and so for the first time show the Earth’s percentage of cloud cover from above. This first experiment in using a satellite to monitor weather was only partly successful. The system relied on the satellite’s spin to give a good field of view, but unfortunately the spin axis achieved was not optimal for the experiment. The system operated for 15 days before a breakdown of the tape recording system ended the flow of data, but for much of that time all that was recorded was starlight. More success was had in the use of Vanguard 2’s radio transmissions to measure ionospheric properties and atmospheric characteristics, adding to the knowledge already being gained from Vanguard 1. Following the success of Vanguard 2, the Naval Research Laboratory decided to retire the Vanguard project. Although it had opened the Space Age and demonstrated the techniques necessary to reach orbit, its tiny payload capability made it of marginal use for any serious scientific or military purposes. The Navy instead planned to develop a new, more powerful launcher, Explorer, with which they hoped to be able to launch satellites of up to 600 kg. However, this ambition would soon appear far too timid. Despite the problems with the R-6 warhead (a second test launch in November had also resulted in the re-entry vehicle breaking up), Chelomei felt confident enough in the missile itself to entrust the Shesterka with its secondary mission, that of launching the USSR’s first satellite. Despite Khruschev’s hopes that they could still make the 31st December deadline for the end of the IGY, Chelomei persuaded him that it was better to take a little more time and get it right rather than rush into failure. It was therefore not until the turn of the New Year that the 1 300 kg “Iskusstvennyy Sputnik Zemli Odin” (“Artificial Earth Satellite One”, ISZ-1) was installed at the peak of a Shesterka rocket. In temperatures which dropped below -10 degrees Celsius, the ground crews worked through January to make the launcher ready. With all checks completed, the R-6 was moved to the pad and fuelling commenced on Monday 19th January. After two days of further tests ensured everything was ready, the launch key was turned and the rocket lifted off the pad at 15:03 local time (10:03 UTC). Just as with the previous two launches the Shesterka performed as expected, lofting the satellite, still attached to the Blok-B second stage, into an initial orbit of 185 by 1 768 km. At this point Chelomei hoped to demonstrate a capability to re-start the Blok-B’s vernier engines, using them to raise the perigee of ISZ-1 by a few hundred kilometers. Unfortunately this proved unsuccessful, with the verniers firing for only a few seconds before shutting down again, raising the orbit by only a dozen kilometres. Chelomei nonetheless considered this to be a qualified success, and shortly afterwards ISZ-1 was separated from its carrier rocket. Back at the OKB-1 facility in Podlipki, near Moscow, the ISZ-1 control team now took over the mission. Unfortunately, the orientation of the orbit was such that the perigee (the point at which the spacecraft was lowest and therefore moving at its fastest) was over the northern hemisphere, meaning that ISZ-1 was only visible from the control stations at Podlipki, Ulan-Ude and Khabarovsk for periods of three to thirteen minutes at a spell, leaving little time to downlink telemetry or uplink commands. To partially overcome this handicap, ISZ-1 was equipped with a tape recorder which would store all the data collected by its instruments for the previous 105 minute orbit and then play it back at high speed during the brief periods of contact with Ground Control. From these quick bursts, the initial indications were that ‘Object D’ was in perfect health and operating as designed. An early period of tension came during Orbit 6, at 18:40 UTC, when ISZ-1’s ground track would for the first time pass directly over the territory of the United States. Unlike the Vanguard launches, Tyuratam’s high latitude meant that it wasn’t possible to craft an orbit that would avoid overflying US airspace. Coincidentally, this first overflight would pass almost directly over Washington DC. How would the Americans react to this intrusion? The Soviet Embassy had alerted the US government of their successful launch within moments of confirmation of the orbit, and American radar and tracking stations were more than capable of spotting the satellite during its previous two orbits, so ISZ-1’s appearance over the Capitol should not come as a complete shock. Even so, there was a nervous atmosphere in Podlipki as technical and military officers packed the control room, despite the late hour, to await contact with the satellite after its first foray over the Imperialist heartland. There were audible sighs of relief from the assembled military brass when contact was re-established on schedule at 22:57 Moscow time (18:57 UTC). The Americans, it seemed, were not going to blow ISZ-1 out of the sky for violating their territory. Then, hard on the heels of relief came exuberance. They would not destroy the satellite because they could not! Soviet spacecraft could cross the United States at will, and there was nothing the Americans could do about it! At 20:26 UTC the satellite ground track again entered US territory, this time over Arizona, and again there was no response. The Americans were impotent before the might of Soviet science! Although clearly a vast exaggeration of reality, such feelings were nonetheless also present in some parts of the US military. They had of course known that the Vanguard satellites passed over many nations as a matter of orbital mechanics, and that by adjusting the launch they could easily make a spacecraft overfly the USSR. But to have another power, a hostile power, do the same to the US was… unsettling. When the news was reported in the paper morning editions and over the radio and television networks, the general public mood was one of surprise. To most Americans, despite their possession of thermonuclear arms, Russia was still perceived as a backward nation of peasant farmers. Now it appeared that they were catching up with the US in technology, and if they could send a satellite over America, why not also a bomb? Government spokesmen emphasised that the US had launched a satellite more than six months before the Soviets, and that even now the Air Force’s Atlas ICBM was entering operation with the 576th Strategic Missile Squadron at Vandenberg Air Force Base, California, keeping America ahead of the Reds in the ability to strike across continents. (The news of the 576th’s establishment came to a surprise to many, including its new CO, who was made aware of his promotion just hours before the press release. He would have to wait a further three months before he received any missiles to command). These arguments were largely accepted by the public, but beneath the general confidence that America was still Number 1, there remained a sense of mild unease and vulnerability throughout the nation. In contrast to this general mood of concern, a small smile reportedly passed President Eisenhower’s features as he received news of the Soviet launch. He had long been made aware that the Soviets were getting close to launching a satellite, and his reaction to it finally happening was similar to his opinion of the earlier US achievement: It was a neat scientific trick, but nothing to get excited about. As far as Eisenhower was concerned, the most important aspect of ISZ-1 was the precedent it set for overflights. Ever since his 1955 meeting with Premier Bulganin in Geneva, Eisenhower had been trying to establish a principle of “Open Skies” that would allow the assets of one Superpower to overfly the territory of the other on reconnaissance missions without it being seen as reason for an immediate escalation to war, as a means of ensuring no secret military build-ups could take place. At that time and ever since, the Soviets had flatly refused such a proposal, but now that the Soviets had overflown the US with their satellite they could hardly object to the Americans returning the favour. To cement this principle, as well as to confirm American leadership in rocketry, it was necessary for the US to quickly perform an overflight mission of their own. With the recent cancellation of Project Vanguard and the Atlas ICBM still in trials (despite the USAF declaration that the missile was “Operational”), the only near-term option was the Army’s Redstone. The Army Ballistic Missile Agency had been working on Project Orbiter for several years as a potential back-up to Vanguard, but had been ordered two years earlier to cease all work on space launches. Whilst reluctantly following that command, von Braun had decided that, rather than scrapping the missiles he had, it would be useful to begin a “Long term storage test” of his Jupiter-C vehicle. He had persuaded the Jet Propulsion Lab that such a test would be instructive for their Sergeant upper stage booster as well, meaning that when Defense Secretary Neil McElroy called ABMA commander Major General John Bruce Medaris in January 1959, the Major General was able to confirm that the Jupiter-C and her payload could be made ready to launch within three months of the President’s say-so. The word was given, and so after almost thirty years of dreaming, Wernher von Braun was finally to get his chance to enter the Space Age.